Smart Hands services ensure that technicians will always be available to address issues with your colocation equipment. Skilled technicians are on site 24/7/365, prepared to follow your detailed instructions to complete required tasks, and are a convenient and efficient alternative to hiring third-party vendors. Access to equipment is immediate as skilled technicians are able to manage your equipment for you right away. 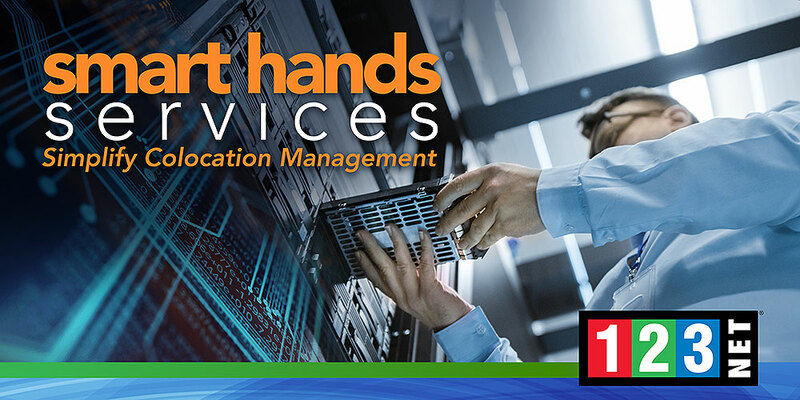 Smart Hands eliminates the travel for staff members or vendors who would otherwise need to visit your data center, saving time and allowing them to shift their focus to other mission-critical tasks. You’re given peace of mind knowing that access to your colocation equipment is always a quick phone call, email, or ticket request away. Why Choose 123Net’s Smart Hands? Asset Management: Audits of spaces & engineering, basic organization/cleaning, confirming power consumption, etc. Logistics Management: Storage, labeling, packing, shipping, moving equipment, etc. On-Site Support: Available 24/7, inspections, testing, resets, customer assisted access, etc. Rack and Stack: New installs, augmentations, equipment removal, cabling, etc. Our Support Team is always available to help your business reduce the frequency and duration of network downtime.